General Motors has filed an application to register “Forward Marine” as a trademark with the United States Patent and Trademark Office (USPTO), GM Authority has discovered. The automaker’s March 22nd, 2019 filing is assigned serial number 88352276, and specifies that the mark will be used in conjunction with the following types of goods and services: boats, namely, electrical propulsion pontoon boats. The trademark filing happened just days before General Motors and its aquatic subsidiary, GM Marine, unveiled a new electric pontoon boat called Forward Marine at the Miami International Boat Show. Last we reported, the Forward Marine is a concept, as neither General Motors nor GM Marine has indicated if the electric pontoon boat would ever enter production. 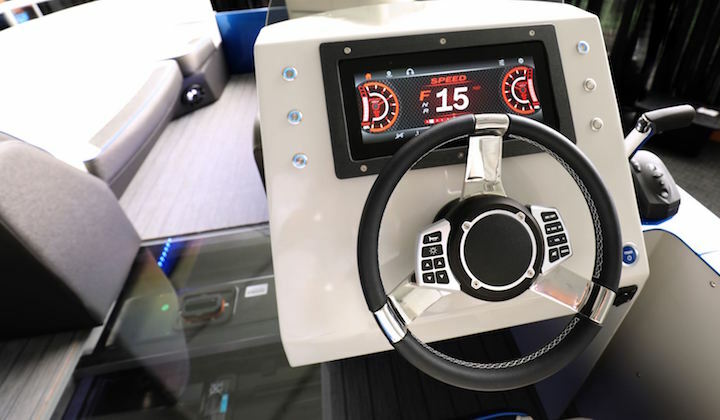 The Forward Marine concept boat uses an electric motor sourced from an automobile and a 60 kWh battery. While GM didn’t say where the powertrain came from, it seems likely that this powertrain is a modified version of that found in the Chevrolet Bolt EV. The mill can allegedly provide up to 10 hours of boating. Subscribe to GM Authority (it’s free!) as we follow this developing story, and for 24/7 GM news coverage.